Starbucks signature espresso combined with freshly steamed milk, rich vanilla, and subtle hints of cardamom and spice. Topped with whipped cream, crushed vanilla bean and a touch of sugar. January may spell the end of the festive season but not of the cold weather. 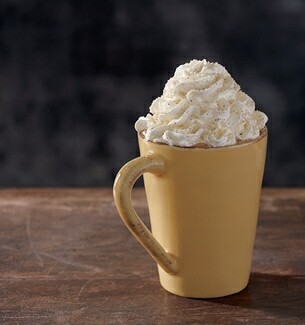 What better way to warm up than with our new Vanilla Spice Latte. The rich delicious aroma of vanilla and cardamom spice make the perfect partner for our caramelly espresso roast. Add freshly steamed milk and whipped cream and top with a sprinkling of crushed vanilla bean sugar. Sure to warm you up when it's cold outside. Also available iced or blended as a Frappuccino®. Vanilla is the world’s second most expensive spice by weight. Cardamom is number 3.